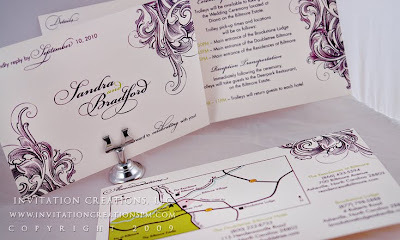 Sandra was an AMAZING client and designing her wedding invitations were so much fun! 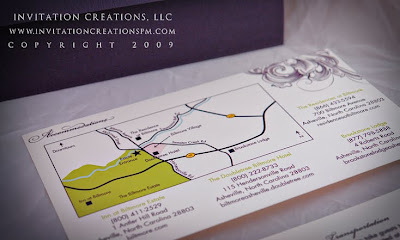 After designing her save-the-dates, she wanted something more formal to reflect the venue and her event at The Biltmore Estate. 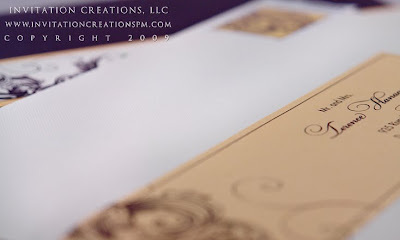 From our initial meeting, she had mentioned her affinity for the 6x9 size invitation which was size I had not worked with yet, so I loved the idea. She also wanted a sample using the 5x7 size. So I designed 2 samples in the 5x7 size and 2 in the 6x9 size. 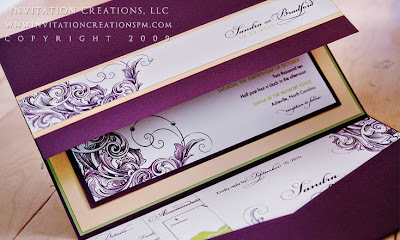 She provided some pics of styles she liked for inspiration when designing her invitation. I designed a more vintage style invitation with modern flairs. Her colors were the eggplant, soft orange and touches of green. Ultimately she chose the 6x9 size invitation. It was my first time working with that size and I must say it has such a presence in size alone. Receiving a invitation like that in my mailbox would have me excited and thinking this is going to be an awesome event based on the glimpse the invitation provided. 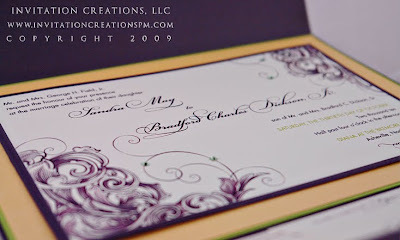 I used 4 layers of paper on her invitation which was another first. It was a great way to incorporate all of her colors. To add a little bling-bling, we added crystals to the invite. It was just another feature to reflect a WOW event! 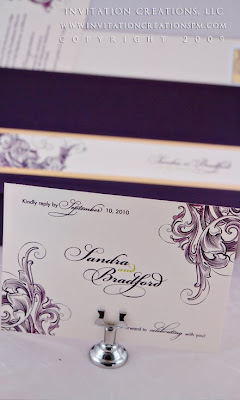 Like her save-the-dates, Sandra wanted to assemble the invitations herself. She enjoyed doing it! Hey, what a great idea and a great way for her to save some money! 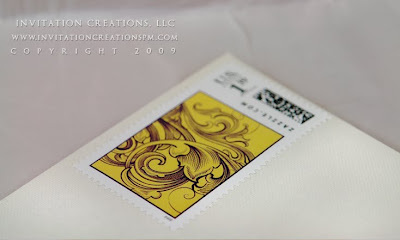 With such a sophisticated invitation, putting a liberty bell just wouldn't cut it, so Sandra asked me to design custom stamps to coordinate with her invitation suite so I did one for the outer envelope and one for her RSVP card. As I have said, Sandra was an uh-mazing client but did I tell you she also had skills? Yep! She designed her own map that she wanted me to incorporate in her inserts! And it wasn't some elementary looking map either. All I had to do was change the fonts and colors to match her suite. I also had the streets names following the path of the street on the map and that was it! Everything else was done by Sandra!! Check it out! Pretty Good! 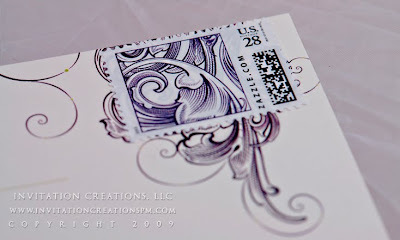 but my favorite was the back of the RSVP card. LOVE! 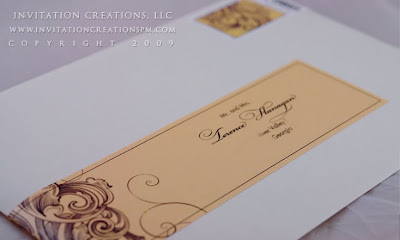 Also Sandra really liked the custom wrap labels versus printing directly on the envelope and so I addressed all of her guests on a custom designed custom label that would wrap around her envelope. I can't say enough about how amazing Sandra was. She was the epitome of an ideal bride. I met Bradford, the groom, as well and he was pretty cool too! 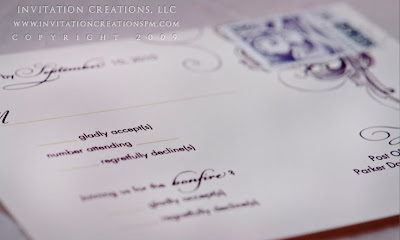 I can't wait to share the reception items we created as well! 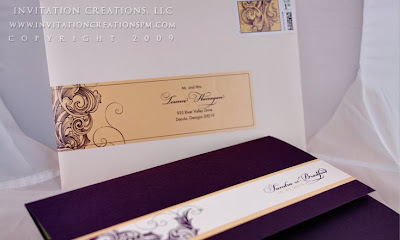 Thank you Sandra for being so great to work with and allowing me the opportunity to collaborate with you on designing your wedding invitations. I wish you nothing but the best! !